Hayes’ Nate White (5) controls the ball in front of Worthington Kilbourne’s Deane Elliott during the second half of Wednesday’s Division I district tournament opener in Delaware. Delaware Hayes boys soccer coach Josh Diehl doesn’t want one result – Wednesday’s 2-1 loss to visiting Worthington Kilbourne in the first round of the Division I district tournament – to define the success or failure of his team. 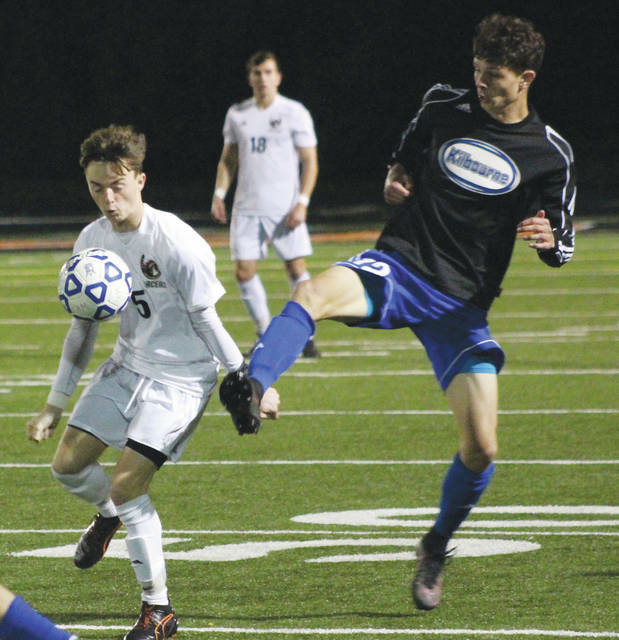 Kilbourne, seeded 27th in the district tournament, scored both of its goals off set pieces in the first half and held off the 17th-seeded Pacers in the second half to cement the win. “It’s easy to let one result kind of define how things (are),” Diehl said. “But, this group has gotten so much better over the course of four years. I’m still so extremely proud of them. Kilbourne missed on its first two free kick chances from in close. But, not its third. Jimmy Sauder found the back of the net off Jacob Roberts’ kick to tie it back up at 1-1 with 10:33 left in the half. Then, Chris Guerra gave the Wolves (5-8-4) the lead off a free kick with 4:10 remaining in the opening half. The Pacers didn’t have many opportunities on net in the first half, but the one they did, they made count. Zak Koch centered to Brody Kannally who scored on Delaware’s first shot on net for a 1-0 lead with 14:24 left in the half. Noah Meehan had seven saves in goal for the Pacers (8-5-4). Jason Bowen also had seven saves in goal for the Wolves. Kilbourne faces fifth-seeded New Albany in the second round Saturday at 4 p.m. at Westerville Central High School.